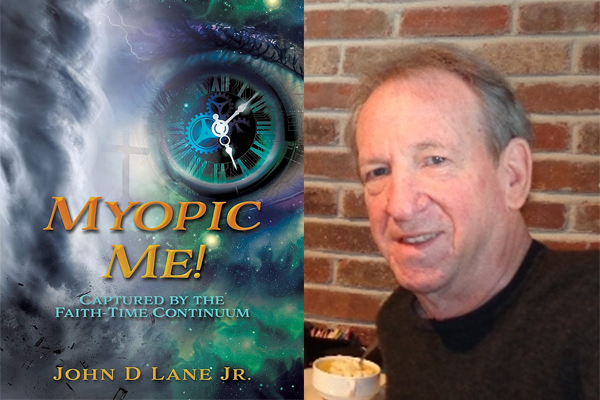 Local author, John D. Lane Jr., will be at An Unlikely Story to introduce his debut novel Myopic Me!, which he wrote right in An Unlikely Story's café. Spend the evening with John as he shares his story and the spiritual journey of faith he took while writing it. In the foothills of the Blue Ridge Mountains, the story of Myopic Me! begins the day that Hirohito yielded his sword on the aircraft carrier Missouri in Tokyo Bay. Through a series of historic and personal events in John Lane's childhood and young adulthood, he faces near death and feelings of hopelessness before finding peace through the Voice speaking through the Faith-Time Continuum. Today, Einstein's Space-Time Continuum has become a cold religion; however, the Faith-Time Continuum speaks to a new generation with the voice of hope and love. If this story of Myopic Me! helps you hear the Voice speaking through the Faith-Time Continuum, John Lane hopes you will also read additional books soon to be published. Each one expands the universal persona of Myopic Me! :Time Travel with Solomon and Einstein; Freedom from Religion; Tearing Down the Dividing Walls of Hostility; The False gods of Identity; The Seventh Seal. The Faith-Time Continuum tracks his fractured journey through many chapters. When his story is told, with the help of Sheldon, Solomon, Dorothy, Alice, Einstein, and many others, He hopes you will see that your own story has great significance in God's eyes. God challenges us to choose life, imposing one necessary and sufficient condition: "Believe in the Son Whom I have sent." At Clemson University, John D. Lane Jr. was inducted into Gamma Alpha Mu Honorary Writers Fraternity whose members had received Pulitzer Prizes and had become Editors in Chief at two major newspapers. John received a Master of Fine Arts degree from UNC at Greensboro, and a Master of Science degree in Communication and Rhetoric at Rensselaer. He has written fourteen-hundred articles for his long-running blogs and has worked for six major corporations, landing in New England, where he now resides with his wife and son in North Attleboro. His first book Myopic Me! was published in October of 2018.